As Windows Mobile 6.5 handsets go, LG's eXpo on AT&T is very near the cream of the crop -- it's got Snapdragon and a biometric scanner, after all -- but we all know that the spec sheet doesn't tell the whole story with this one. 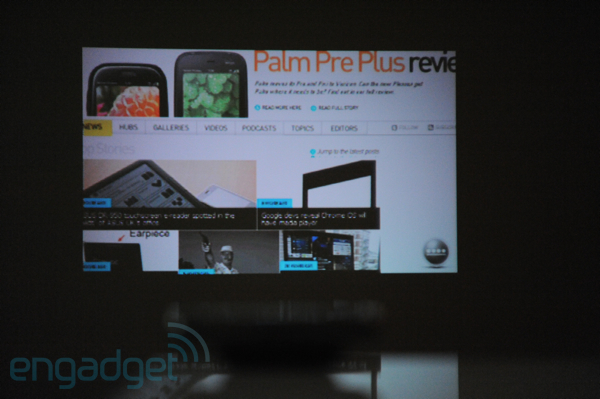 Really, people care about this phone because of the trick $179 pico projector that you can optionally bolt underneath. Besides being insanely cool, the concept makes sense considering the eXpo's target demographic -- business users probably want to be able to share documents and PowerPoints on the go, right? We've just taken delivery of the Mobile Projector for the eXpo here, turned down the lights to a romantic level, and quickly put it through its paces. First off, we were pleasantly surprised by the phone's dimensions with the projector attached -- it looks weird, obviously, and it's both thick and heavy, but we didn't find it at all awkward to hold to our face for a call, and you could still slip it in a pocket if you absolutely had to (don't lose the standard battery cover, though). The system automatically detects that the accessory has been attached and pops up a message to let you know that the camera will be disabled; instead, you can use the camera button to switch the display between portrait and landscape mode, which is a lot more convenient than holding the phone and rotating it 90 degrees to accomplish the same effect. Sliding the lens cover door open fires up the system and starts the projector; anything you see on the screen is broadcast for all to see. With our lights completely off and a little natural light filtering in through closed blinds, we found the display usable (but not great) from a distance of about 8 feet, which was far back enough to create a decent-sized projection. Any closer and you obviously gain brightness but the display gets small pretty fast. There's a slider on the side of the unit for manually adjusting focus; we found ourselves fidgeting with this quit a bit, never able to settle on a perfectly sharp image, but that was probably a side effect of the fact that we were projecting onto drywall (rather than a projection screen) as much as anything else. If you set the phone on a table to project, it's a little awkward to access the slider, so you're better off adjusting first before setting it down. Over time, the projector got quite warm, but never too hot to touch -- there's a warning label right on the thing about this -- and as you can probably imagine, battery drain was immense. In about ten minutes of usage we went from two bars of battery to one, in fact. Would we recommend plunking down $180 for this on top of the price of an eXpo? As a cool "check this out" kind of toy, absolutely -- and we suppose you could run a presentation with a small handful of audience members in a completely dark room in a pinch if you absolutely had to -- but as a daily business tool, the technology just isn't there yet. Once TI and everyone else working on this tech can figure out how to shove a few more lumens in there and draw a little less juice, though, they might just have a winner on their hands.